The invitations from Rachel Kim of Fourteen-Forty include all the goodies: hand calligraphy, a wax seal, gorgeous vintage stamps, and spot illustrations. The classic and clean neutral palette with pops of blush and gold is the perfect choice for these Italian destination wedding invitations. Clean, classic, and executed to perfection! From Rachel: Cayla and Brian celebrated the end of summer with their friends and family by planning a destination wedding in Ravello, Italy just above the Amalfi Coast. Ocean views and traditional Italian architecture made this wedding one of the most beautiful weddings we’ve ever seen! Cayla and Brian wanted to keep a neutral palette with touches of blush and gold here and there. 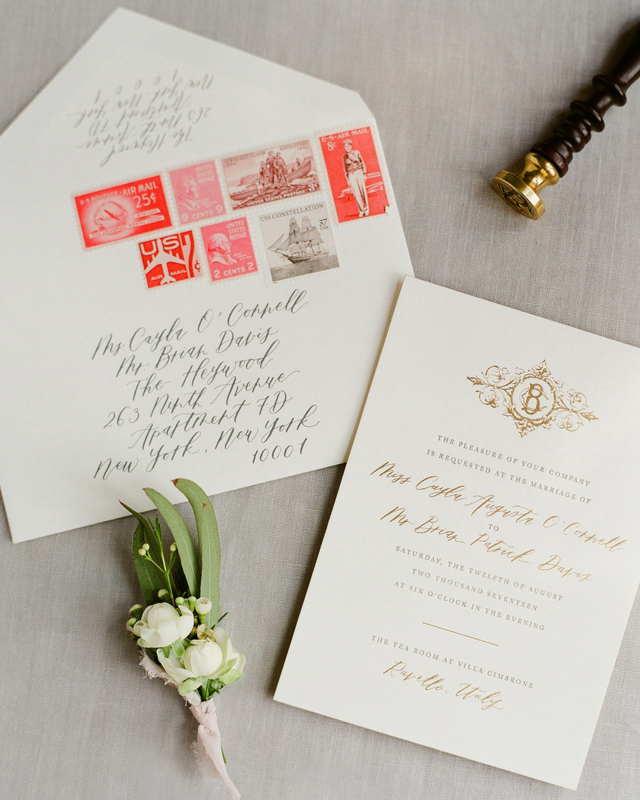 After their very first meeting us, it was clear that their invitations would include all of our favorites: hand calligraphy, a wax seal, and vintage stamps. In keeping with the elegance of their venue, we went with a double thick letterpress invitation complete with gold edge painting for a little something special. To top it off, we designed a beautiful monogram using their first initials and tied all the pieces together with a blush ribbon. We like to think that any type of wrap whether it’s made of vellum, string or a bellyband makes guests feel like they’re unwrapping a present! For their main envelope, we sourced a variety of travel inspired vintage stamps in shades of pink, red and burgundy. In addition to charcoal ink calligraphy, we sealed every invitation in our classic gold wax. As much as we love all the other colors we offer, you can’t go wrong with a gold seal! Day-of pieces like menus, programs, napkins, matches and welcome notes are opportunities to have a little more fun, especially for a more classic wedding. We always recommend a map and events card to our clients getting married abroad. They’re a great way to get your guests excited about the trip ahead! Cayla and Brian fell in love with our accordions and so we designed two different maps; one that gave guests a general idea of where Ravello is and another that combined the weekend events, transportation details, and hotel options.